Nestled in the heart of Central Hong Kong, Arcane is the brainchild of multi-award winning chef, Shane Osborn. 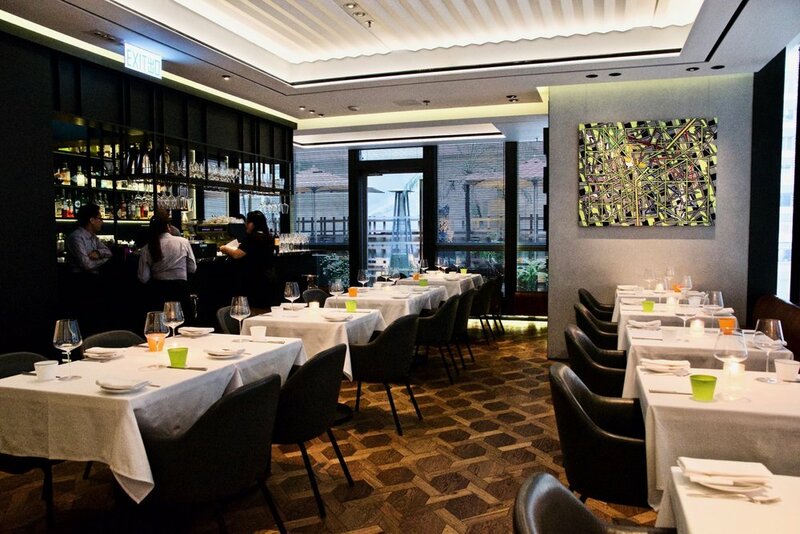 The one Michelin star Arcane reinvents the fine dining approach to cuisine by offering a humble yet discerning culinary experience to Hong Kong. As the name implies, Arcane is private and discreet, away from the hustle of the city or crowded restaurants. Despite its prime central location, the environment is quiet and the surroundings calm. The service team are tested and trained to anticipate their loyal customers’ needs through genuine consideration, perception and true hospitality. The 2000 square foot space houses artworks sourced by Flowers Gallery, a London and New York based contemporary art gallery. 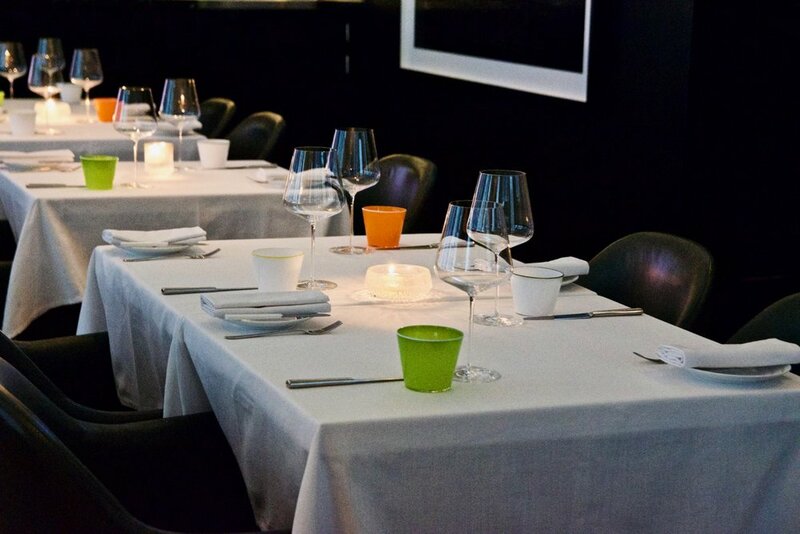 Oak is used throughout the restaurant on the floor, while tabletops are covered with crisp linen with silverware and stemware supplied by Bernadaud, Zalto and David Mellor, keeping the look clean, without artifice, but focusing on materials. The open kitchen provides patrons with a view into the kitchen where Osborn is at work. If you want to get in on the action make sure you sit at the ‘Kitchen Counter’, where Osborn is on hand to interact with his guests to explain the dishes as he cooks. The first Australian to be awarded one and two Michelin stars (during his tenure as head chef and co-owner of Pied-a-Terre, London), Chef Osborn delivers the finest quality modern European cuisine presented in six starters, six mains and five desserts, alongside specials and set business lunches. Osborn delivers the same dedication, passion and attention to detail in every dish he crafts at Arcane, as he did in his previous award-winning restaurants that earned him his Michelin stars and accolades. The menu is elegant and heroes seasonal ingredients sourced from Japan, UK, France, and Australia. Osborn also uses his terrace kitchen garden to grow a selection of 30 different varieties of herbs, fruits and vegetables that feature on the menu. The wine list, comprises a dynamic selection from some of the world’s finest winemakers, with a particular focus on Burgundy reds and whites. We loved tasting our way through the menu with wines expertly matched by the restaurant’s sommelier. To start the dish of Japanese fruit tomato with imam bayildi, rocket pesto, sour cream and marfuga olive oil was wonderfully fresh and enticing. 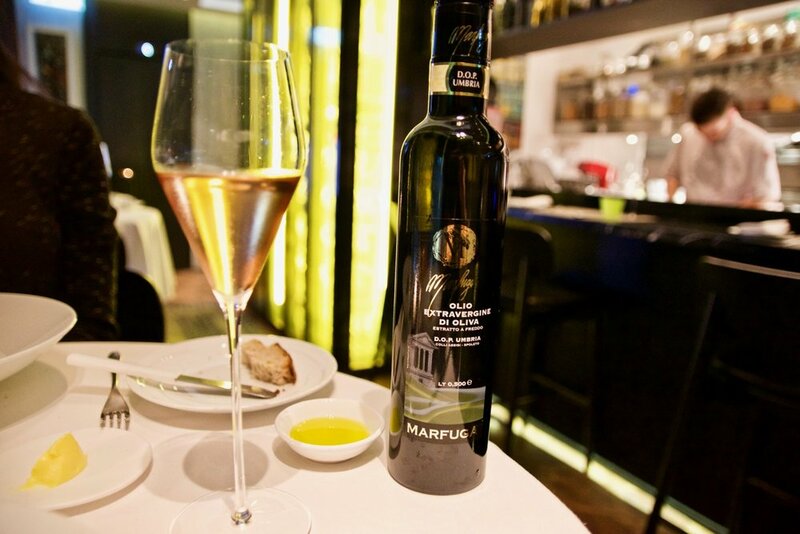 We loved the dish’s Mediterranean influence and the use of aromatic marfuga olive oil. The cured Hokkaido scallop was similarly delicious. 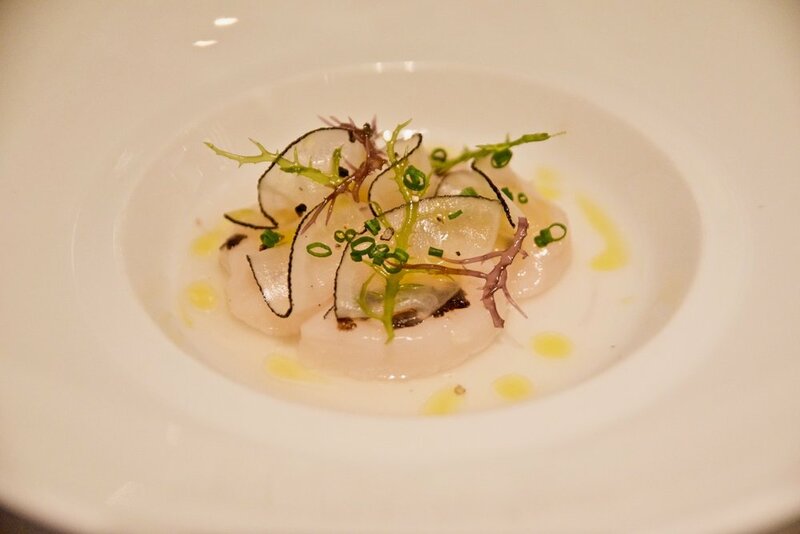 The plump scallops were bursting with natural flavour which was further enhanced by the restrained sweetness of the apple consommé, dashi infused daikon and spring onion. The sautéed potato gnocchi graced our presence next. A dish which boasted punchy flavours with masterful restraint, we loved how the pillow soft gnocchi melded with the caramelised leek, cep vinaigrette and shiitake duxelle. 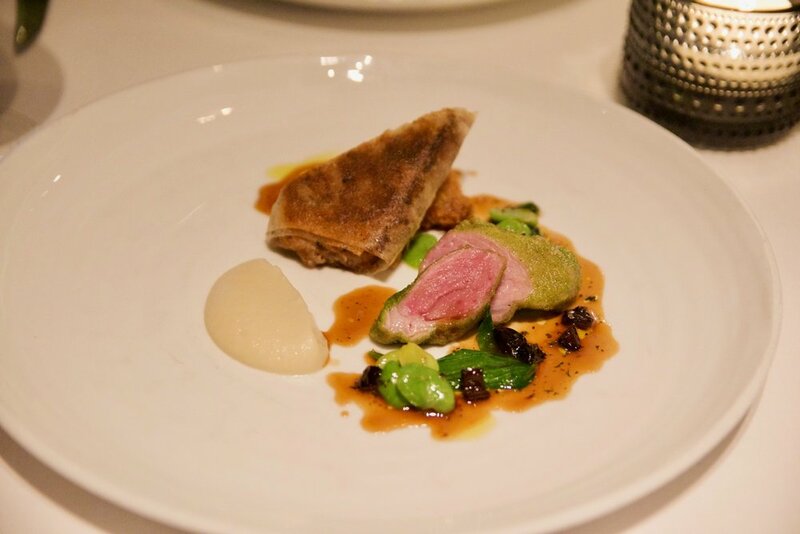 For mains, the Pyrenean milk fed lamb certainly gratified. Lamb cooked two ways (seared and slow cooked) was served with broad beans, a luxurious jerusalem artichoke purée and an earthy jus. Our savoury courses came to an end with a lovely cheese served with house made pear chutney, semi dried grapes and toasted lavoche. Desserts showcased Osborn’s versatility. 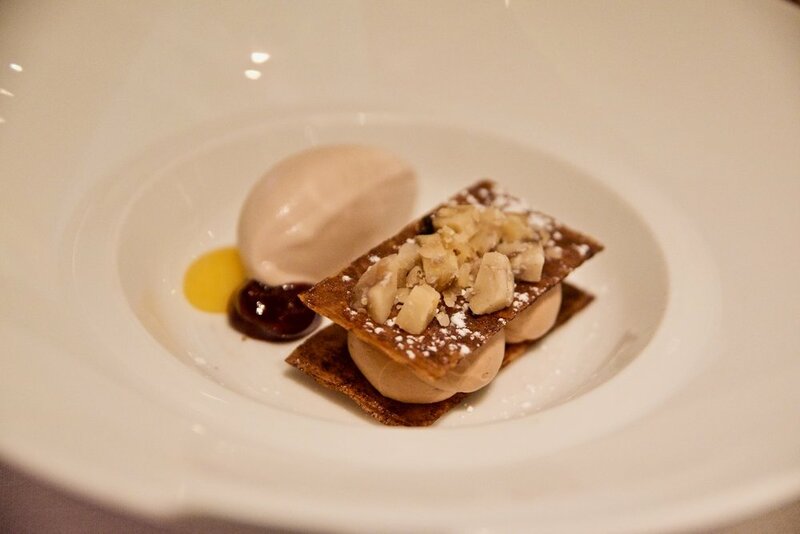 Think Chocolate mille-feuille served with caramel cream, cherry gel, lemon curd and chestnut ice cream and Yuzu and lemon posset served with blood orange and yoghurt ice cream and white chocolate tuile. Simply delicious.